When playing Japanese Role Playing games, have you ever wondered how the shopkeepers in the towns that litter the worlds of such games get their stuff? Seriously, they have all of the things and they are selling them for a king's ransom and you just have to wonder, where did they get these things from? I'm here to tell you that Moonlighter answers that question by placing the player in the role of one of these very same shopkeepers and I'm afraid it's far from the easy life you assume they have. While you're out saving the world, they're out foraging for the very stuff you are buying. Moonlighter is set in a mythical land where gates into alternate dimensions have appeared across the land. People entered them and those who returned were laden with unimaginable treasures. Over time as more people plundered these dungeons the treasure has begun to dry up and Will, the main protagonist of Moonlighter finds himself the owner of a shop he does not want that sells the treasures that no longer exist in the dungeons that have been plundered. He wants to become a hero, like the ones he sells his wares to, but he's got a long road ahead of him before he can reach such dizzying heights. I stumbled upon Moonlighter at the rather large PAX West 2017 booth of 11 Bit Studios, the publisher of the game who is working with Digital Sun to see it released early in 2018. 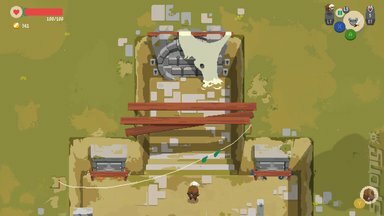 What caught my eye was how Moonlighter played, as it requires the player to delve into dungeons in a Binding of Isaac-like manner, all for typically very little reward. Yes, there are times when amazing treasures are revealed, but that normally comes at an exceptional cost and one that you're not keen to expose the player character to if you can at all help it. Moonlighter takes on the concept of risk/reward head on by forcing the player to balance the gathering of materials to sell in their shop against the need to acquire more things. The latter is a trope from more traditional adventure games but Moonlighter is not really about tradition as it wants to instil in the player a sense of consequence for their actions. 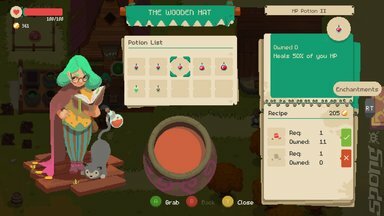 The shopkeeping element of Moonlighter is a contrast to the dungeon crawling and reminds me a little of Ultima Online and the Star Wars Galaxies MMOs as they too had a market system that players had to engage in if they were to become successful in any way. Moonlighter requires the player to set prices of their items and, based on the customers' reaction to their cost, the player can then determine the optimum value of them. Supply and demand play their role in this mechanic too, so the prices can and do change over time. 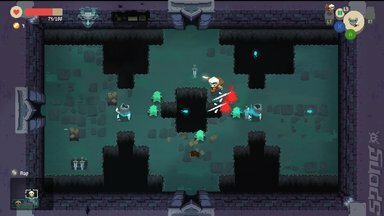 The use of low resolution pixels in Moonlighter aids with determining the location of enemies and objects as well as of Will himself. Contrasting colours and shadows are used to great effect as are the hundreds of frames of animation that are applied to all of the creatures and objects in Moonlighter. Sound effects are satisfyingly crunchy and provide good feedback as to how they are doing with respect to both damage taken and being delivered by them. The score is suitably atmospheric and the tempo is just right, dependent as it is on what the player is doing. Moonlighter is due to appear later this year on the PS4, Xbox One, Windows PC, Mac and Linux.